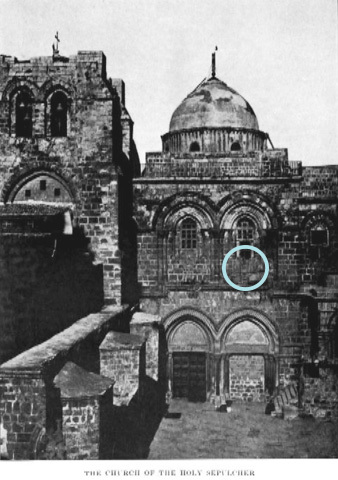 This ladder, perched under a window on the right side of the Holy Sepulchre in Jerusalem, was first documented in 1757. Apart from two brief exceptions, it has remained there ever since. And some would say it’s not likely to move. Ever. 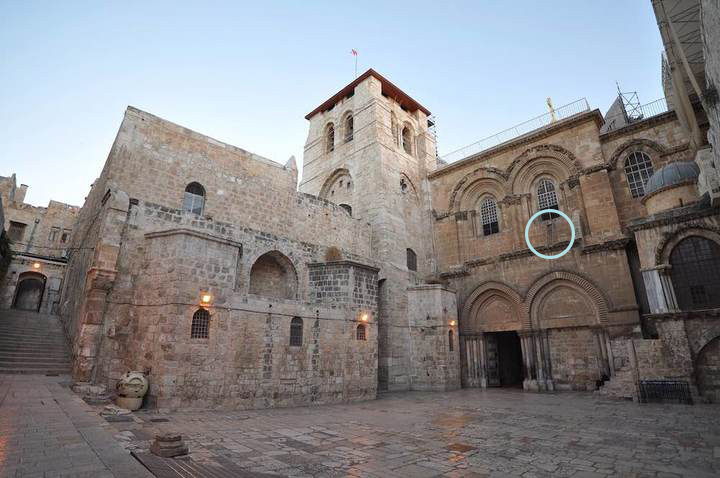 The Holy Sepulchre is the church that stands on the site of Christ’s crucifixion, burial, and resurrection. The original church was built in 335, demolished in 1009 and rebuilt in 1048. Since then, it’s suffered fires and numerous attempts at destruction, and the single building that stands today is a conglomeration of many efforts to reconstruct and renew this sacred site. Because it is such a sacred site, every Christian denomination wants to have a piece of it, and no fewer than six different entities share a control: Greek Orthodox, Armenian Orthodox and Roman Catholic, and to a lesser degree the Egyptian Copts, Syriacs and Ethiopians. When six different organizations have ownership in one shared thing, you might expect that there would be some controversy. And there has been. The controversy resulted in an agreement called the Status Quo in 1757, which divided certain holy sites in Bethlehem and Jerusalem between the major entities that were each vying for rights of ownership. It also declared that required that no work could be done on any of these shared holy sites without the agreement of every member of the agreement. This photo of the Church of the Holy Sephulchre, taken in 1885, includes the ladder visible below the upper-right window. While the Status Quo has eased tensions a bit, it has had other, unintended consequences. One of those is that getting anything accomplished in regards to the care and maintenance of any of these shared sites is almost impossible. That includes coming to an agreement on who the ladder belongs to, who should move it, and what should be done with it. As such, the ladder has remained nearly untouched for at least 250 years. While the first mention of it is made in the 1757 edict, it’s origin remains unknown. It’s suspected that a stone mason was told to abandon his work in response to the declaration of the Status Quo. Since then, it’s moved only twice. In 1981, the Israeli police foiled an attempt to move it, though they never caught the culprit. In 1991, it was moved briefly to rest under the window on the left side of the church, possibly to enable crews to remove scaffolding that had been used to renovate the bell tower. 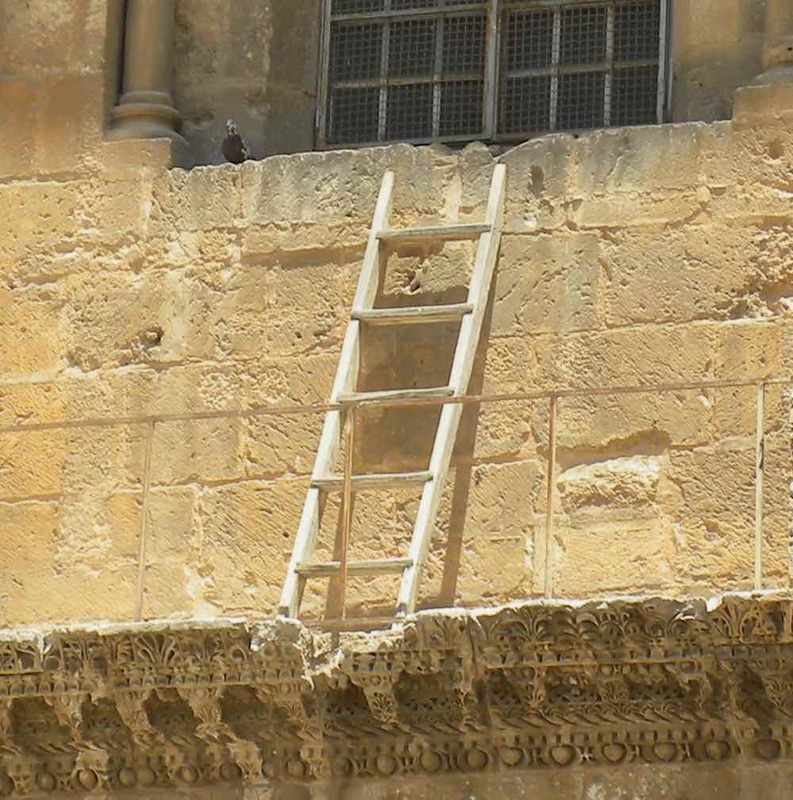 In 1997, the ladder was removed for several weeks, most likely by a prankster, who returned it when the situation was rumored to be creating fresh conflicts among the Armenian and Greek Orthodox Churches. In 1964, Pope Paul VI gave a pontifical order that the ladder was to remain in place until the Catholic Church and Orthodox Church reach a state of ecumenism. Since that division has existed for much longer than the ladder – 963 years, to be exact – it is hard to imagine that the chasm will be bridged within our lifetimes or the life of that ladder.  However, we can continue to pray for unity, even as we recognize the relationships within our own lives that suffer from separation and division, praying that those might be healed as well. Would you like to visit the Holy Land, walk in the footsteps of Christ, and see the “immovable ladder”? Click the button below to view our featured Holy Land pilgrimage!